The Foundation for Landscape Studies is pleased to announce the winners of the 2011 John Brinckerhoff Jackson Book Prize for recently published books that have made significant contributions to the study and understanding of garden history and landscape studies. The winners are listed in alphabetical order. 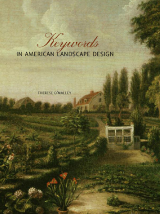 This beautifully illustrated historical dictionary of landscape-design vocabulary used in North America from the seventeenth to the mid-nineteenth century defines one hundred terms and concepts related to garden planning and landscape architecture. From alcove, arbor, and arch to veranda, wilderness, and wood, each entry includes a wealth of documentation, textual sources, and imagery. The broad geographic scope of the support material reveals patterns of regional usage, while the chronological range provides evidence of changing design practice and landscape vocabulary over time. Drawing upon a rich assortment of newly compiled documents and accompanied by more than one thousand images, this dictionary forms the most complete published reference to date on the history of American garden design, and reveals landscape history as integral to the study of American cultural history. 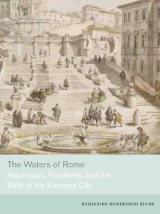 In this pioneering study of the water infrastructure of Renaissance Rome, urban historian Katherine Rinne offers a new understanding of how technological and scientific developments in aqueduct and fountain architecture helped turn a medieval backwater into the preeminent city of early modern Europe. Supported by the author’s extensive topographical research, this book presents a unified vision of the city that links improvements to public and private water systems with political, religious, and social change. Between 1560 and 1630, in a spectacular burst of urban renewal, Rome’s religious and civil authorities sponsored the construction of aqueducts; private and public fountains for drinking, washing, and industry; and the magnificent ceremonial fountains that are Rome’s glory. Rinne explores the technological, sociopolitical, and artistic questions that the designers faced during a turbulent age when the authority of the Catholic Church was threatened and the infrastructure of the city in a state of decay. She shows how these public works projects transformed Rome in a successful marriage of innovative engineering and strategic urban planning. 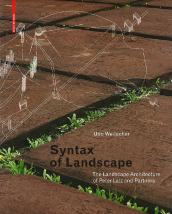 For Udo Weilacher the term “syntax of landscape” entails reading the different layers and meanings of historically charged locations through visual linkages to a network of spatial and temporal references. To exemplify this process he has chosen several landscapes designed by Peter Latz and Partners, including the Duisburg-Nord Landscape Park, the Plateau de Kirchberg in Luxembourg, and the Dora Park in Turin. He discusses the way in which these and other works by the firm represent an intelligent use of alternative environmental technologies and function as renewable reconstructions of entire industrial landscapes. He also explores the aesthetic language that makes these spaces seem timeless. In Traveling the Shore of the Spanish Sea, photographer Geoff Winningham has created a travel journal with more than two hundred images of the volcanoes, rain forests, and steep mountains of the southern coast of Veracruz and the salt marshes along the Texas coast near High Island. 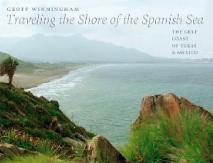 His discussion of the role that the Gulf of Mexico played in the discovery and exploration of the New World gives the book a historical dimension, and his photographs depicting both pristine and despoiled landscapes show the region’s great natural beauty while awakening environmental concern.